22722 Stoney Lake Sun Lakes AZ is now for sale in Oakwood CC. 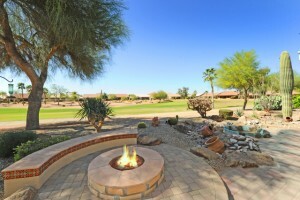 Welcome to the Desert Southwest and 23722 Stoney Lake in Sun Lakes AZ! You will love this gorgeous Sienna floor plan with two bedrooms, two baths and a separate office that can be used as a third bedroom. 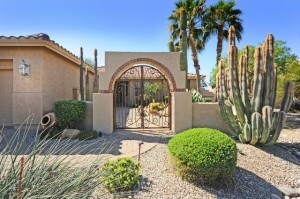 This home is situation on the Sonoran golf course and is spectacular from entry to patio and everything in between! Pavers line the driveway and lead into a private courtyard with iron gate. Inside you will continue on pavers past the water feature and lush landscaping to the front door. Enter to a great room floor plan with hardwood flooring, custom paint, custom entertainment center and fabulous views of the golf course. This kitchen is a dream with renovations that open it to the family room and golf course. Granite counters with maple cabinets and slider doors, tile back splash, island and stainless appliances make cooking or entertaining a delight! The patio offers pavers continuing with extended pergola, built in natural gas fire pit, plenty of room for outdoor entertaining and the BBQ stays! Recreation: golf, tennis, pickle ball, fitness center, swimming pools, restaurants and more! Private with golf course views and master bath with dual sinks, shower, separate water closet and huge walk in closet.